This 130 000 hectare reserve in the Northwest Province is situated on the Botswana border. Home to the Big Five, it is best known for its substantial population of the highly endangered African Wild Dog.Madikwe is regarded as one of the finest conservation areas in Africa, offering all the major species, including Lion, Leopard, Elephant, Buffalo, both White and Black Rhino along with almost all the plains antelope species.Over 350 species of birds have also been recorded at Madikwe Game Reserve including many interesting raptors. 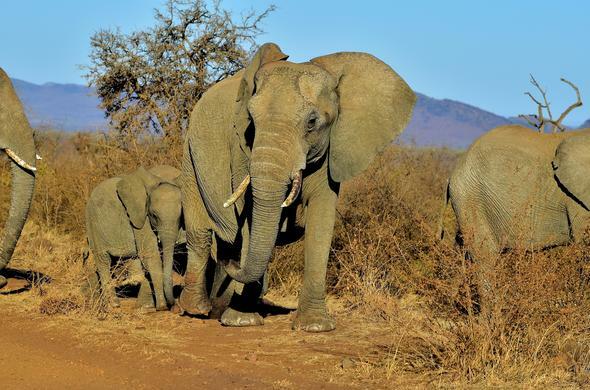 Visitors will truly have a great safari experience at Madikwe Game Reserve.The reserve consists of vast plains of open woodlands and grasslands, dissected by the rugged Rant van Tweedepoort, and bordered in the south by the Dwarsberg Mountains. The area is dotted with huge rocky hills or inselbergs.A special feature of Madikwe Game Reserve lies in its unique location, a transition zone on the edges of the Kalahari, where a number of rare species occur naturally. The climate is generally mild to hot, but winter nights can be cold.The 4 privately run accommodation options in the park range from 'fun, comfortable and budget' to superbly luxurious. Visitors will be able to do an escorted walk, as well as the usual game drives. Madikwe is malaria-free and is about 4 hours from Johannesburg.